A cost-effective way to increase safety and mobility on a street is to put it on a diet. A road diet, that is. A road diet reconfigures a roadway cross-section to safely accommodate all users, increase mobility and access, reduce crashes and improve a community’s quality of life. Through the Every Day Counts initiative, the Federal Highway Administration is encouraging state and local agencies to consider road diets as a safety-focused alternative for mixed-use streets. A common type of road diet involves converting a four-lane undivided road to three lanes with two through lanes and a two-way turn lane in the middle. The reclaimed space can be allocated to uses such as bike lanes, pedestrian refuge islands and parking. That was the Virginia Department of Transportation’s experience when it reconfigured part of Lawyers Road in Reston. Five years later, a safety study revealed a 70 percent drop in crashes on the 2-mile segment. The Virginia DOT opted for a road diet after evaluating traffic volumes on the four-lane road and analyzing the crash types that were occurring, such as rear-end crashes involving vehicles waiting to turn left. Before proceeding with the project, the agency held community meetings to answer residents’ questions and solicit feedback. One concern was potential traffic congestion, but many supported the conversion. Bicyclists favored the planned bike lanes because they would enhance their safety and connectivity. Seventy-four percent of respondents believed the project had improved Lawyers Road. Sixty-nine percent said the road seemed safer. Sixty-nine percent said auto travel times had not increased. Forty-seven percent bicycled on the road more often than before. “All of our reconfiguration projects have been success stories,” said Dongho Chang, city traffic engineer in Seattle, Washington, which has been using road diets since 1972. That includes a road diet implemented on a 0.9-mile section of Stone Way to improve pedestrian safety and better accommodate bicyclists. Some local business owners opposed the Stone Way reconfiguration because they were concerned about traffic on the north-south arterial overflowing onto other streets. The bicycle community supported the project by organizing traffic counts and a demonstration ride and commissioning an independent report that concluded reconfiguration would not produce congestion. Top speeders—those traveling more than 10 miles per hour over the speed limit—decreased more than 80 percent. Total collisions dropped 14 percent. Injury collisions declined 33 percent. Pedestrian collisions decreased 80 percent. The volume of bicyclists increased 35 percent. In addition, daily traffic counts on parallel streets declined 12 to 34 percent. And the corridor has sustained its capacity to carry the same number of vehicles despite the reduction in the number of travel lanes. For more information and technical assistance on road diets, contact Becky Crowe and Keith Harrison. 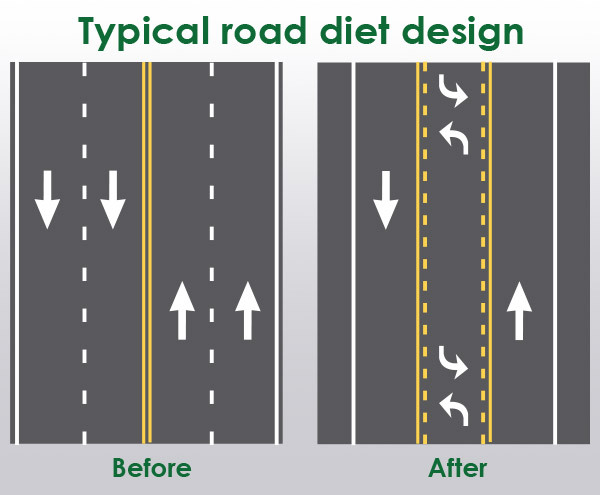 View the EDC Road Diets presentation for a roadway reconfiguration overview, including case studies and lessons learned. Watch the EDC Exchange: Road Diets webcast for a discussion of road diet benefits, applications and success stories. 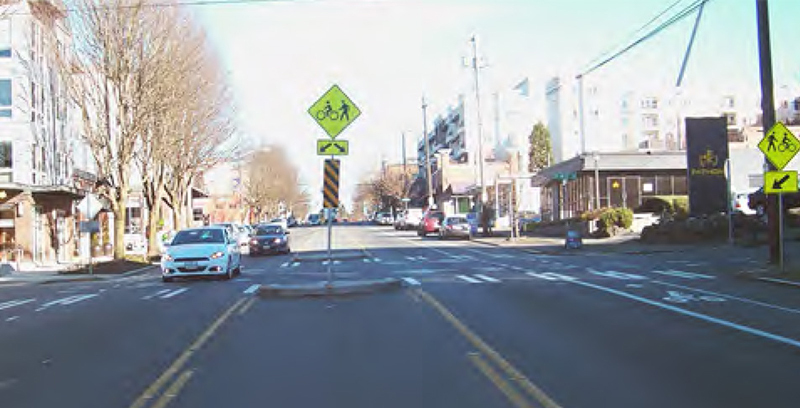 Read Road Diet Informational Guide for details on the decision-making process to determine if road diets are a good fit for a corridor, as well as design guidance and post-implementation evaluation. Read Road Diet Case Studies for 24 real-life examples and advice on planning and implementing road diets. Read Evaluation of Lane Reduction Road Diet Measures on Crashes for an analysis of the effect of road diets on crashes. See the FHWA Office of Safety Road Diets page for more roadway reconfiguration resources. 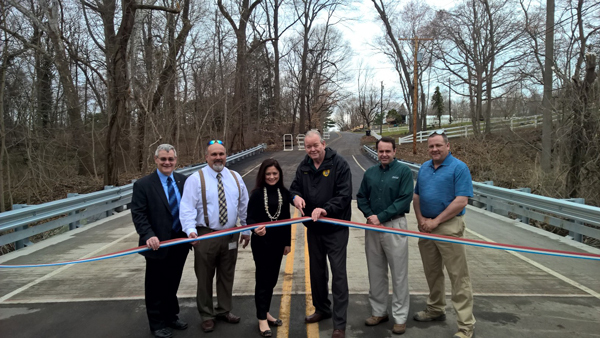 When flooding forced the closure of the Jessup Mill Road Bridge over Edward’s Run in Mantua Township, New Jersey, county officials turned to a quick but effective solution to reopen the vital community link: geosynthetic reinforced soil-integrated bridge system technology. GRS-IBS, an Every Day Counts innovation since 2011, is helping meet the nationwide demand for small, single-span bridges by delivering low-cost, durable structures that can be built with commonly available equipment and materials. Instead of using joints, deep foundations, approach slabs or cast-in-place concrete, this project used a prefabricated superstructure supported on GRS-IBS abutments built using layers of geosynthetic reinforcement and compacted fill. Built in 1925 and rehabilitated in 1940, the Jessup Mill Road Bridge included a reinforced concrete arch culvert and an 84-inch diameter corrugated metal pipe that was beyond repair, requiring a 6-mile detour for the 2,300 travelers who used the bridge each day. 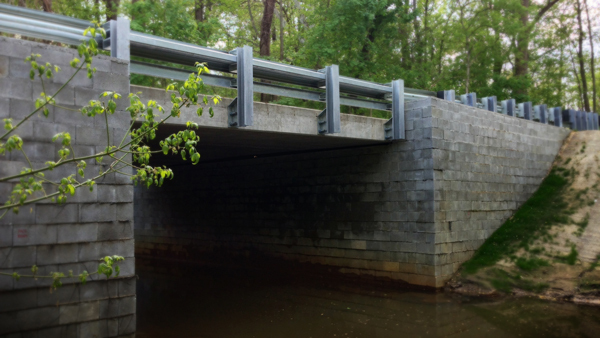 Although GRS-IBS was a new approach in New Jersey, Gloucester County officials chose the technology to minimize the cost and duration of the bridge replacement, which took place from December 2014 to March 2015. Using GRS-IBS cut at least a month—about 25 percent—from the construction timeline, and the experience gained from the county’s first use of the innovation is expected to save even more time on future projects. Using GRS-IBS instead of conventional construction also allowed crews to replace the bridge during winter weather. The new structure was constructed within the footprint of the old bridge to maintain both vertical and horizontal alignment. The span is 22 feet long and 32 feet wide to accommodate two 11-foot lanes and 5-foot shoulders. Curtis Shugars, Vincent Voltaggio, Heather Simmons, Robert Damminger, Ron Moore and Michael Sheahen celebrate the opening of the new Jessup Mill Road Bridge. The new bridge used a prefabricated superstructure consisting of prestressed concrete beams and a composite reinforced concrete deck supported on a GRS-IBS structure. The U-shaped GRS abutments and wing walls kept the new bridge within the right-of-way limits. Jessup Mill Road is about 13.5 feet above the Edward’s Run channel bed. The 17-inch-thick concrete superstructure provided the greatest hydraulic opening of the alternative bridge types evaluated. Joseph Spadea is a senior engineer and project manager for Pennoni Associates Inc. in Newark, Delaware. Explore the Federal Highway Administration’s growing library of reports on projects using new technologies and practices to see how highway programs can benefit from innovation. FHWA expanded its collection of Highways for LIFE demonstration project reports that explain how transportation agencies used innovations to enhance safety and quality while accelerating construction and minimizing traffic impacts. The reports summarize construction details, performance metrics and lessons learned on projects built with $75 million in Highways for LIFE grants awarded between 2006 and 2013. FHWA also has reports detailing the results of Accelerated Innovation Deployment Demonstration program projects. The AID Demonstration program offers incentives to use proven innovations on any aspect of highway transportation, including planning, financing, environment, design, construction, materials, pavements, structures and operations. Since its 2014 launch, the program has provided more than $27 million through 38 awards. The Vermont Agency of Transportation was awarded a Highways for LIFE grant to demonstrate the use of three innovative strategies to rehabilitate segments of U.S. 4A and Vermont 30 in the Castleton area. The project provided the agency with experience using warm-mix asphalt, intelligent compaction and the Safety EdgeSM for major highway rehabilitation. As noted in the Warm-Mix Asphalt Overlay and Rehabilitation of U.S. 4A and VT 30 report, the project was considered a success. Using warm-mix asphalt produced at lower temperatures than traditional hot-mix asphalt reduced the time needed for the newly applied asphalt mat temperature to drop. That resulted in 30 percent less waiting time before the lane could be reopened to traffic. Using intelligent compaction on the job increased pavement uniformity, which is expected to increase the service life of the overlay. And using the Safety Edge paving technique minimized vertical drop-off at the pavement edge to make it easier for vehicles that drift off the roadway to return safely. “Crashes are expected to be lower over the project’s service life because of design features and a more durable pavement surface,” the report stated. The Michigan Department of Transportation received an AID Demonstration grant to use slide-in bridge construction for the first time when it replaced the U.S. 131 bridges over 3 Mile Road in Morley. The agency also used the construction manager/general contractor project delivery method to get early contractor input on using the bridge slide technique. The Michigan Department of Transportation AID Grant Final Report details the bridge slide project that minimized traffic disruption and increased safety on a major route linking cities in southern Michigan with resort areas in the north. An analysis showed this construction technique saved user delay costs by reducing the need for a traffic detour to five days while prefabricated bridge superstructures were slid into place. No worker injuries were reported, in large part because crews did not work next to live traffic for most of the project. The South Dakota Department of Transportation received an AID Demonstration grant to deploy high-friction surface treatments. to improve safety on four horizontal curves, two on U.S. 14A near Deadwood and two on I-229 in Sioux Falls. The AID Demonstration Project: High-Friction Surface Treatment report notes that before the treatments were applied, the curves had crash rates two to four times higher than average, with most incidents occurring during snowy or icy road conditions. The project’s goal to cut roadway departure crashes at the curves by at least 25 percent was exceeded during the first winter after the treatments were placed, when crashes dropped 78 percent. After its positive first experience with high-friction surface treatment, the South Dakota DOT is adopting it as a standard operating procedure for future projects. Across the country, the use of alternative technical concepts in highway project procurement is catching on fast, offering the potential to lower costs, save time, increase safety and deploy new technologies and practices. ATCs give contractors the opportunity to propose innovative, cost-effective solutions during a competitive procurement process that are equal to or better than the contracting agency’s design and construction criteria. More than half of state highway agencies have used ATCs on projects delivered with the design-build contracting method. Before the second round of Every Day Counts began in January 2013, only Missouri allowed ATCs with the more traditional design-bid-build process. Now, Michigan has also used ATCs on design-bid-build projects—and 20 other states are seriously considering using them as a contracting tool in the right project situation, according to Craig Actis, project management engineer at the Federal Highway Administration’s Resource Center. Some states, including Missouri and Michigan, don’t require special legislation to use ATCs with design-bid-build, while other states need new laws. 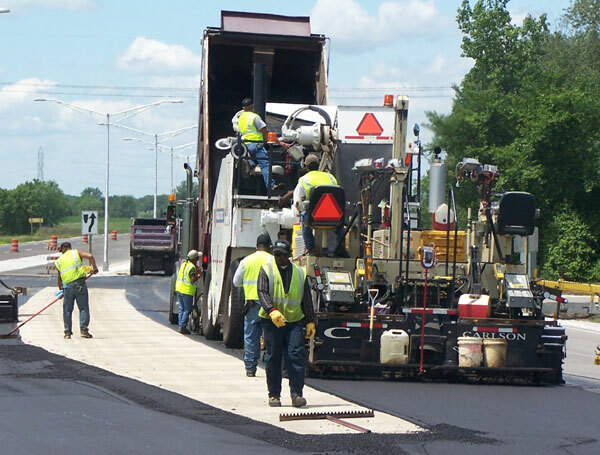 When the Michigan Department of Transportation piloted ATCs with design-bid-build, it focused on staging traffic on a two-year, $22 million freeway rehabilitation project on U.S. 10 in Midland County. The Michigan DOT developed a base set of traffic staging plans that could be bid on and used by any contractor. The ATC process permitted contractors to propose concepts that met the requirements and provided a cost-effective, efficient way to maintain traffic. All ATCs submitted were kept confidential. The agency reviewed and approved the ATCs during the project’s six-week advertisement period, and contractors were able to base their bids on either the Michigan DOT’s plan or their approved ATCs. The winning bidder was able to reduce the project from two construction seasons to one, increasing safety, limiting work zone impact on the public and saving money. The Missouri Department of Transportation uses an ATC process that is scalable. The agency began developing the process in 2007, at first allowing only limited-scope ATCs on certain project components, such as grading, bridge structures or traffic control and staging. Through the agency’s partnership with industry, the ATC process has evolved to allowing contractor innovation on the entire scope of a project. Contractors provide alternative design concepts to Missouri DOT staff during confidential, one-on-one meetings before bids are opened, and the agency evaluates the concepts on a pass-fail basis. Contractors can choose to bid their approved ATC or the Missouri DOT base design provided for the project. All bids, ATC and non-ATC, are accepted and the traditional low-bid process determines the winning bid. Using this process has produced significant savings and competition on projects. The Missouri DOT used a design-bid-build ATC process when it replaced the aging Hurricane Deck Bridge on Route 5 over the Lake of the Ozarks in Camden County. The low ATC bid was $8.1 million below the lowest bid on the Missouri DOT-furnished base design. 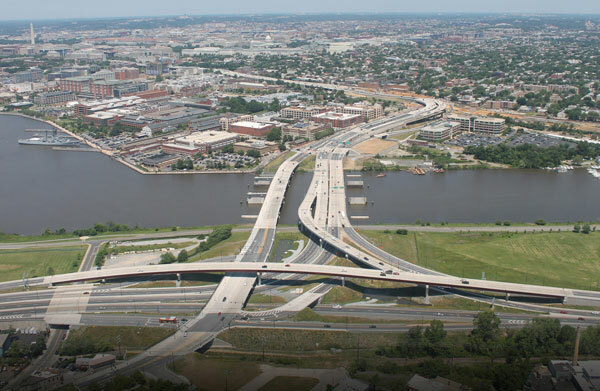 The District DOT used alternative technical concepts on the 11th Street Bridge project in Washington, D.C. The District Department of Transportation is using ATCs with the design-build process on the 11th Street Bridge project in Washington, D.C., the largest project in the agency’s history. ATCs reduced the total cost of replacing two bridges with three new bridges by $80 million and accelerated construction by nine months. The project is scheduled for completion in 2015. The New York State Department of Transportation used ATCs on the Tappan Zee Hudson River Crossing project, with four teams submitting a total of 58 ATC proposals. Other states using design-build ATCs include Alaska, Arizona, Mississippi, New Mexico, Utah and Vermont. For more information on ATCs and how to use them, see FHWA’s Alternative Contracting Methods Library or contact Craig Actis or David Unkefer of the FHWA Resource Center. How many crashes on a roadway are too many? Methods available today can help transportation professionals answer a question that has plagued them for years. Advances in highway safety analysis can provide transportation agencies with the reliable information they need to make smart investments in safety improvements. Through the Every Day Counts initiative, the Federal Highway Administration is encouraging broader use of two approaches to data-driven safety analysis—predictive and systemic—to better target highway safety investments and reduce crashes and fatalities. “Resources are scarce these days for all agencies, so we have to use the money we have wisely to help us make the best decisions for safety, for mobility and for our communities,” said Hillary Isebrands, FHWA safety engineer. Predictive approaches combine crash, roadway inventory and traffic volume data to provide more reliable estimates of an existing or proposed roadway’s expected safety performance, such as crash frequency and severity. Results of the analysis can be used in roadway safety management and project development decisions and safety countermeasure selection and evaluation. “Predictive analysis can help quantify safety impacts similar to the ways agencies do with construction costs, traffic operations and environmental impacts,” said Jerry Roche of the FHWA Office of Safety and a leader, along with John McFadden of the FHWA Resource Center, of the EDC Data-Driven Safety Analysis Innovation Deployment Team. 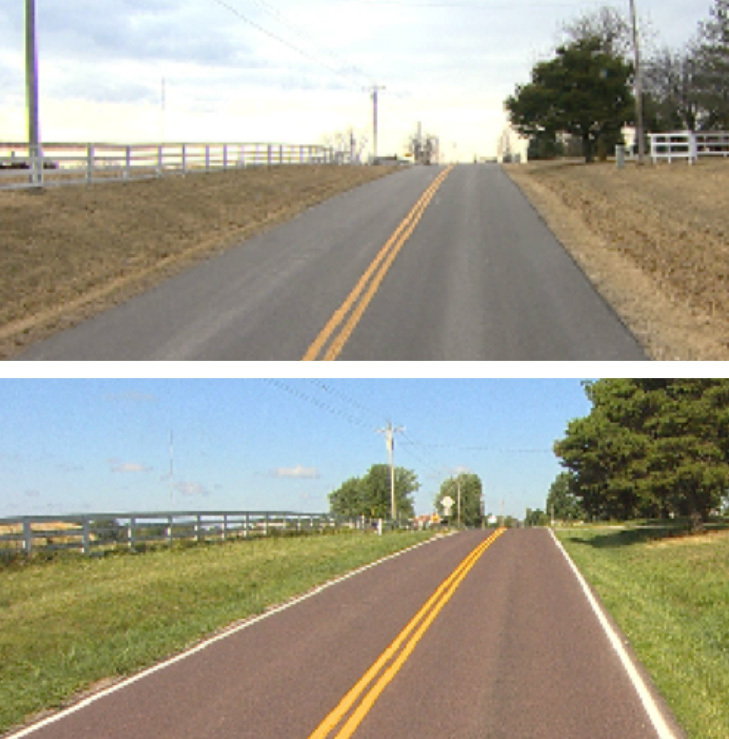 Using a systemic approach, the Missouri DOT added edgeline stripes to improve safety on rural roads such as Route M in Boone County. Among the state highway agencies using predictive safety analysis is the Ohio Department of Transportation, which applied the technique to estimate the expected performance of three alternatives for reconstructing the I-270 and U.S. 33 interchange in Dublin. The analysis provided quantitative data that helped the agency choose a preferred alternative during the project’s engineering and design stage that addressed both traffic congestion and safety. Construction of the new interchange began in spring 2015. Systemic approaches screen a road network for high-risk features associated with severe crashes, such as certain types of horizontal curves, and identify low-cost safety treatments, such as enhanced delineation with wider edgelines or chevrons. These techniques are particularly applicable when a significant number of crashes occur over a wide area, such as on rural and local roads, and for specific crash types, such as those involving vulnerable road users. “Instead of implementing high-cost improvements at a small number of locations, agencies can use a risk-based approach to deploy low-cost improvements across the identified portion of the system, which is much more effective in reducing fatalities,” said Roche. Historically, the Missouri Department of Transportation painted centerline and edgeline stripes on routes that carry an average of 1,000 or more vehicles a day, while routes with average daily traffic of less than 1,000 received just a centerline stripe. When a systemic safety analysis found a large number of severe crashes on roads carrying 400 to 1,000 vehicles a day, the Missouri DOT took a proactive approach and painted edgelines on all 7,500 miles that fell in this ADT range. So far, crashes have dropped 15 percent. For information and technical assistance on data-driven safety analysis, contact Jerry Roche and John McFadden. Register for the Selecting the Right Systemic Safety Treatments webcast from 1 to 3 p.m. ET on September 29. Mark your calendar for the Advancing Systemic Safety Implementation Efforts webcast from 1 to 3 p.m. ET on November 17. View past webcasts in FHWA’s systemic safety webinar series. Watch the EDC Data-Driven Safety Analysis presentation for a discussion of safety analysis approaches and case studies. See the EDC Exchange: Data-Driven Safety Analysis webcast for details on how agencies are integrating safety performance into highway investment decisions. FHWA’s Interactive Highway Safety Design Model is a suite of software analysis tools to evaluate the safety and operational effects of geometric design decisions on highways. AASHTOWare Safety Analyst software can be used to proactively determine which sites have the highest potential for safety improvement. The Crash Modification Factors Clearinghouse, a web-based database of factors used to compute crash numbers after a safety countermeasure is implemented, can be used to identify appropriate countermeasures for a site. FHWA’s Systemic Safety Project Selection Tool provides a step-by-step process for conducting systemic safety analysis and a mechanism for quantifying the benefits of systemic safety improvements. The Federal Highway Administration’s Turner-Fairbank Highway Research Center has developed innovative solutions to the nation’s highway challenges for more than 65 years. Several Every Day Counts innovations—including adaptive signal control technology, warm-mix asphalt, diverging diamond interchanges and eNEPA—were once the focus of projects at the center. 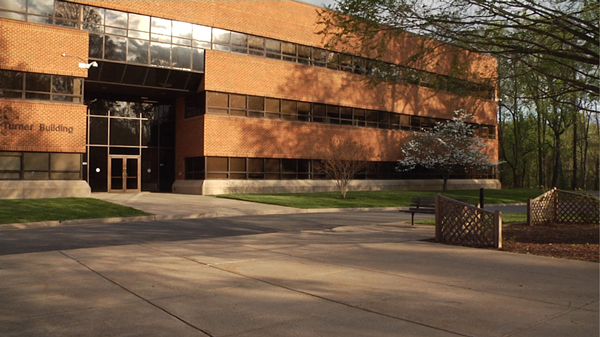 Watch the new video that tells the center’s research and technology story. 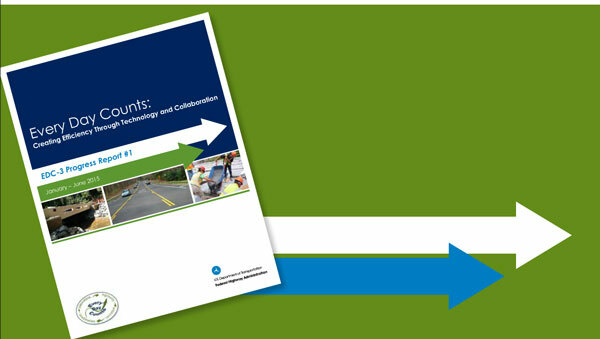 A new electronic publication—EDC-3 Progress Report #1—summarizes the June 2015 deployment status of the 11 innovations in the third round of the Federal Highway Administration’s Every Day Counts initiative. Transportation stakeholders are collaborating in states across the country to implement the EDC-3 innovations in 2015 and 2016. Crews finished concrete work for the new three-tower cable-stayed bridge across the Ohio River in Louisville, Kentucky, this summer. This design-build project is constructing the Downtown Crossing, the first new bridge across the Ohio River in the Louisville metropolitan area in more than 50 years. Installation of steel girders, precast deck panels and cable stays will continue for the rest of the year with the bridge scheduled to open in early 2016. The Downtown Crossing is part of the $2.3 billion Ohio River Bridges project, a joint effort between Indiana and Kentucky. Workers completed construction of the San Luis Street Improvements project near the San Luis Port of Entry, Arizona’s second-busiest border crossing. The construction manager/general contractor delivery method was used because of the complexity of the project and the importance of keeping port traffic moving during construction. The project rerouted port traffic from U.S. 95 to local roads and improved access to downtown businesses. Safety enhancements include two roundabouts and a pedestrian-activated signal. The Federal Highway Administration’s Accelerated Innovation Deployment Demonstration program awarded $7.1 million in grants to fund nine more innovative projects. The grants will be used to deploy innovations such as e-Construction, warm-mix asphalt, adaptive signal control technology and data-driven safety analysis on projects in Florida, Kansas, Montana, New Hampshire, Rhode Island, Washington, Wisconsin and the National Park Service. Delaware’s State Legislature voted to grant the Delaware Department of Transportation legal authority for full use of design-build and limited use of construction manager/general contractor as project delivery methods. The legislative approval followed a CM/GC workshop attended by a legislative representative, Delaware DOT staff, consultants and contractors, with presenters from Colorado, Maryland and Utah.